Pack your bags--we're heading to Wordpress. Mostly because I just spent an hour over there fixing it up. I hope you come with me! So I'm plotting a new book that I plan to start writing March 1. I thought I had it all nicely cast. And then I started watching Justified. Y'all. Have you seen Justified? I remember seeing Timothy Olyphant on something years back, as a bad guy, and I googled him and thought he was smoking. But as Rayland Givens...Oh. My. God. That voice, that accent, that body. He's a little slender for my taste, but yowza. My hero is a country singer from a small town, and I was going to use Puck from Glee as the model, but I just can't get excited about him. Timothy is a bit older than I'd like since my hero is supposed to be in his early 30s and Timothy is about 10 years older, but I can't resist that voice. I think I'm going to buy the first season of Justified, and I've already loaded my Netflix queue with movies he's been in. What do you think of him? 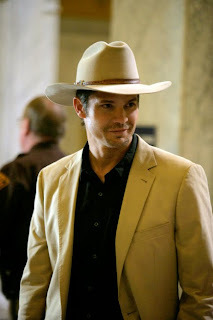 Do you watch Justified? Does he do it for you? It's been awhile! And so much is going on! First, look at my new cover! Two Step Temptation is available for pre-order from Samhain Publishing for only $1.75! That's 30% off! It's also available from Amazon for $2.00. AND I contracted another book with The Wild Rose Press this week. Riding the Storm Out is my first menage. Eep! Check back soon for some excerpts!